QUAKETIPS: Does bottled water really expire? The FDA says no! Every now and then, during the question period at the end of my talks, I get asked how long bottled water lasts and whether you can keep it past the expiration date; and I experience temporary panic. You see, I have typically kept my bottled water a year or two past the printed expiration date, because I’ve found it to be such a hassle to lug 14 gallons (in our case; 1 gallon per person per day for 7 days*) to a sink, empty them (it takes a LONG TIME), discard the jugs, and lug 14 more gallons from the store and individually bag them to put them on the shelf in our closet! I figure that even if it was unhealthy to frequently drink water that had been stored too long in plastic jugs, my emergency water is for an extremely rare event and I won’t mind a few days of it. However, I worry about giving this advice to people, because while I have felt that it is probably not a problem, I don’t know for sure. I would not want to counsel people to drink water that was potentially contaminated with leached chemicals. So, I answer that the expiration date on those gallon jugs typically gives you a year or two, and that I tended to over-store mine but this was not official advice and I could not guarantee that the water was healthy. Well, yesterday I was reading a back issue of Consumer Reports (from October 2012), and they had a letter in their “ask our experts” column asking how long water should be used after purchase and whether the expiration date was meaningful. To my surprise, they said that the US Food and Drug Administration (FDA) considered bottled water to have an indefinite storage life as long as it was produced in accordance with regulations and was unopened. Let’s take a closer look at this, because not having to rotate out all this water would avoid a major hassle. So this sounds promising! However, it’s from 2002, and while the page was last updated in March, the last few years have witnessed increasing debate about bisphenol A (BPA), the chemical in some plastics that’s been found in baby bottles, food can liners, and some plastic water bottles. If I drink 10-year-old water from an unopened jug, will I be full of BPA? “The Food and Drug Administration’s assessment is that the scientific evidence at this time does not suggest that the very low levels of human exposure to BPA through the diet are unsafe. The agency has performed extensive research on BPA, has reviewed hundreds of other studies, and is continuing to address questions and potential concerns raised by certain studies. FDA scientists have also recently determined that exposure to BPA through foods for infants is much less than had been previously believed and that the trace amounts of the chemical that enter the body, whether it’s an adult or a child, are rapidly metabolized and eliminated. Research has shown that people are exposed to BPA because small amounts can migrate into the food and beverages from their containers. Reports from some animal studies have raised potential concerns that BPA exposure may cause multiple health problems, including reproductive disorders, diabetes and cardiovascular disease. Aha. So I went into my closet in which I had installed extra shelves on the back wall to hold 12 gallons of water (we just did not have any room for gallons 13 and 14!) and took a look at one of the jugs, with 2011 expiration dates. 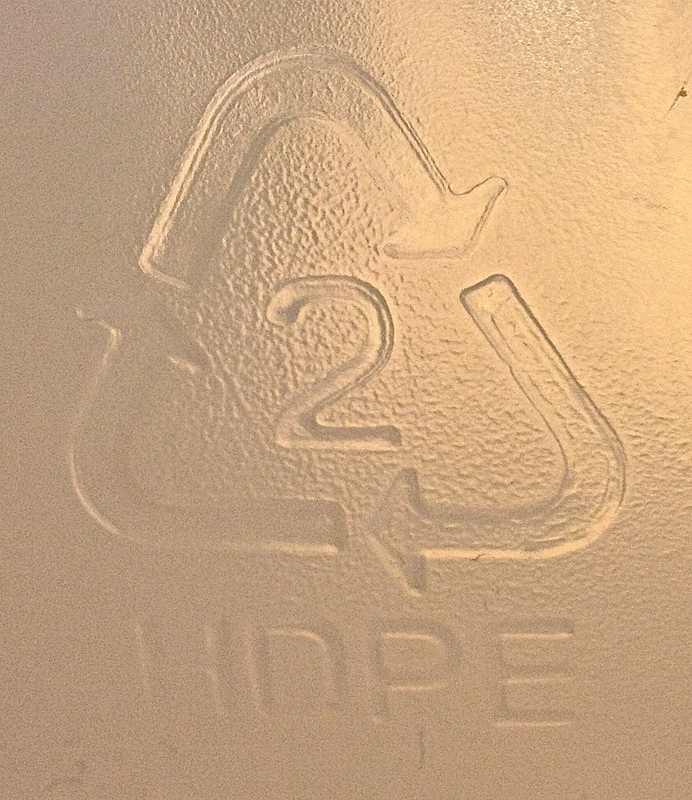 The recycle symbol shows a 2. So now I have a few more reasons to feel ok about storing my emergency water for a long time, and not minding if it tastes a bit off if I ultimately have to use it. 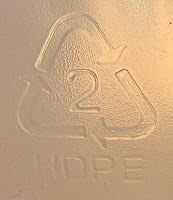 If you are concerned about BPA, you can at least make sure you get water jugs that don’t have the 3 or 7 recycle symbol. Remember also that if worse comes to worst, you can drink the water in your water heater assuming it is undamaged, and yes, the UPPER tank of your toilet has water that has never touched anything undesirable, as long as it is clear and colorless and doesn’t have added toilet cleaners. The running water from the tap might be suspect if the water pipes are damaged, so if that is all you have, the Centers for Disease Control and Prevention (CDC) says to pass it through a coffee filter or cloth if it is cloudy, and boil it for 1 minute (3 minutes over 6500 ft elevation) before drinking whether it’s cloudy or clear. If boiling isn’t an option, water purification tablets or a tiny bit of bleach can sterilize it; to 1 gallon water, add 1/8 teaspoon unscented bleach (8 drops, 0.75 milliliters) if water is clear or twice that amount if water is cloudy; mix and wait for 30 minutes. Hmm, I see that the same CDC website also says “observe the expiration date for store-bought water” and so does the Red Cross. Argh....well, it sounds like the FDA has been studying the issue pretty thoroughly and they are the ones who are charged with regulating bottled water. Note though that if you take your own water from the tap or another source and store it in your own bottle, all bets are off. There’s no guarantee that you will have safe water to drink after 6 months; it depends on the condition of the water and the composition of the container or liner that you use. Also, everything I’ve said is based on US standards and I can’t vouch for its accuracy if applied to other countries. Nonetheless, if you are buying bottled water in the US or of comparable quality standards, hopefully this information has quenched your thirst for knowledge. 3/10/14 update: The San Francisco Chronicle ran a story today about a study in which some BPA-free plastic products were still observed to contain chemicals with similar potential effects as BPA. The study hasn't undergone peer reviewed publication (it is based on toxicology reports from a commercial lab and a lab at UC Davis), and the products tested are gimicky sippy cups that change color, so it's difficult to infer whether this is relevant to those BPA-free clear plastic water jugs. Moreover, your emergency water will be used for just a few days rather than drinking questionable water daily for years. However, given the relevance of the recent report to the findings presented in this blog article, I wanted to mention it for the sake of providing a balanced picture. 10/16/14 update: It's advisable to not store your emergency water bottles in hot areas; a shed in the middle of the back yard in the sun is probably not a great idea. This may increase the chances of the plastic breaking down in as yet unknown ways. 7/28/17 update: Out of curiosity, I have opened a bottle of water from my closet that has a 2011 best-by date and tasted it. It actually tastes fine; better than the tap water in a lot of US cities, and with no hint of plastic or chemical taste. You may be interested in reading the subsequent article that I posted on 10/16/14 about whether or not portable water filters can substitute for stored emergency water (they can't). Thank you, and I'm glad to hear that the talk audiences are still benefitting from the blog! We sure are, Matt! Thank you - the question about water has bothered me for a long time, so I am particularly grateful for your careful assessment. Hi,Unopened economically bottled water will keep safe inconclusively,the length of the flasks remain appropriately fixed and aren't harmed.Since it is packaged under sanitary,great manufacturing techniques; is in a sanitary fixed compartment; and does not contain substances,(for example, sugars and proteins) regularly connected with food spoilage,bottled water can be put away for amplified times of time without concerns.Good day. If in doubt when it's time to use "expired" water you can always boil it before drinking. This depends on why the water is expired. If water is professionally bottled and has never been opened, then you don't have to worry about contamination with bacteria, protozoans, or viruses, and the only thing that boiling does is to kill germs like these. If the concern is that some sort of plastic additive has leached into the water, then boiling won't make any difference. If the water has been bottled yourself into a used container, and you are unsure of whether it was truly germ free from the start, then boiling will kill any suspected germs. Still, its unlikely that germs that wouldn't have caused a problem when the water was bottled would cause a problem months later. you can always boil it if unsure.or distill it..many youtube vids on homemade water distilling...or sun derived.. Yes, although note the December 8, 2014 comment above; boiling works if you think the water might be contaminated with germs, but that assumes you have a working heat source, and also doesn't take care of any potential chemical contamination in the pipes after a quake. Why do you individually bag your bottled water? Just in case it leaks. Even though the chances of a crack in the plastic are pretty low as long as you don't stack one jug on top of another, I do worry about the theoretical possibility of a crack forming for whatever reason because that would cause major water damage to items below it in the closet and to the floor. And while I hadn't thought about this before, it is also probably wise to not have to deal with several year's worth of dust on the outside of the bottle when opening it! I had a bottle of distilled water for my iron and steamer on top shelf of linen closet and it leaked. What a mess! I now set gallon water bottles in a bowl! Thanks for this information. I was told today that you cannot drink bottled water past the expiration date because the seals of the caps can disintegrate causing contamonation. Is t h is accurate? I could not absolutely guarantee that this won't occur, but I'd find it surprising if it did, since the plastic in those seals is the same plastic that lasts for many years in most situations. Think about all the plastic items you've had for decades. If water bottles are left out in the hot sun, then problems can result, but assuming the bottles are in temperature controlled storage (probably best out of direct light), they should be good. In fact, even if a seal were to have a slight crack in it, what would actually contaminate the water? That one random microbe spore floating through the air could have just as easily landed in your drinking glass, so this doesn't strike me as a big concern. Remember that this only applies to the commercially available, professionally bottled, unopened gallon jugs from the grocery store. Not really sure what to say. The water molecules clearly are not crossing the plastic, and I don't know if there is a slow transfer of oxygen but I would tend to doubt it because O2 is a bigger molecule than H2O. I have heard that oxygen can very slowly cross regular ziploc plastic bags. 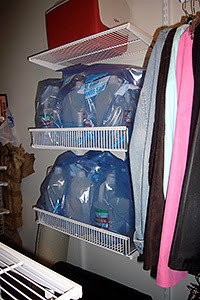 What happen if the water bottles are stored in the garage where the warm weather of Phoenix over 120 degrees in summer. Does this affect the condition of the water? and its longevity? Yes, my understanding is that storage in a hot location can degrade the plastic and is not recommended. If you want to store the water for a long time, it's much better to store it inside your temperature controlled home somewhere, perhaps a closet or pantry. Same goes for the food, the shelf life is reduced in the heat. The cafeteria where i work gave our dept. 6 cases of 12 oz. bottled water that was 6 months expired. Tasted like chemicals. I refused to drink it. Interesting; without more information, it's hard to comment about that observation. One thought is that bottled water should not be stored in hot conditions because that can reportedly lead to plastic breakdown, but I don't know if these were stored under those conditions. For example, bottled water stored in a car trunk can be problematic. I have heard also that "old" bottled water can taste "off" because it has lost its aeration; shaking it after the bottle is opened and closed can get rid of a lot of that taste. Even if the bottled water in question was stored in bottles with some other kind of plastic (see discussion in the main article about recycle code numbers printed on the side), I would be surprised if water just 6 months past that date had accumulated enough leached chemicals to make such a difference. So I am not doubting what you are saying happened to you with those particular bottles, but it's surprising and doesn't match my own experiences with well-stored unopened commercially-bottled gallon jugs, or the information from the FDA. (Note: I have no vested interests here and am not trying to blindly defend the water industry; actually, they'd probably be happier if people dumped water and replaced it on a regular basis!) Thanks for the feedback though! Right, and that is fine for a while but is not good for longterm storage. The key here is not that one can go find water jugs that have been sitting in hot storage conditions, but that one can find new water jugs in good shape and then keep them in cool conditions out of the sunlight. Thanks for the feedback. As in the comment above, it's hard to comment on individual case; sure sounds like a basement closet would be a safe place with regard to temperature. Do you know how old the bottle was when it was stored away And just to be a nitpicky "Devil's Advocate," are you sure the new bottle wasn't made with an improved process that was better than the one used for the older bottle? But the taste issue is hard to discount. 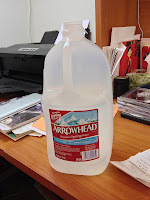 Not sure what to say; see my 7/28/17 update in the main article in which I opened a 1-gallon jug of water from back in 2009, with a 2011 best-by date, and it tasted fine. The info that I have obtained is limited to the 1-gallon jugs, so if the bottle is a smaller size with a different plastic, that could make a difference. Those gallon jugs had a recycle code of 2. I am looking right now at a 20 fl oz clear thin plastic bottle of water that has a recycle code of 1. This might make a difference. I am thinking that old water be used for toilet flushing, and bathing and maybe even the hedge or tree? Well, you know here in California, we had a few years of drought and people were loathe to waste any water, so that would have been a good use at the time. There's certainly nothing wrong with doing it, although it sounds like a large hassle and I think one of the ways to get people to take these precautions is to minimize the hassle. Nonetheless, never let it be said that I encouraged someone to waste water! I buy a gallon jug of commercially prepared drinking water in a safe plastic container. I open that gallon of water and pour out a glassful. Then I reclose the jug with the original cap. I do not drink directly out of the gallon jug. How long will the water remaining in the recapped gallon jug be safe to drink, roughly. If you can find an answer for that, I will be very grateful! You know, that is a great question and I have wondered about it also. I imagine that there are practical vs. official answers to that, since water on its own doesn't go bad in the first place so the two main concerns with old water are if something has leached out of the container into it, or if there are chemical or pathogenic contaminants in the water from the start. I personally would think that if it was fine before it was sealed, and you know entirely what has happened to it during the time it was opened, it's hard to conceive of any new problems that would be introduced during the brief open period. But the official answer by those who would be liable if their product caused a problem is probably still to not drink it. As is so often the case, it comes down to personal judgement and I think it would be unwise for me to suggest that someone should ignore an official safety recommendation, so I'll just leave you with those thoughts and you can determine how to proceed. Of course, replacing one new jug of water isn't a major inconvenience or cost, so the question really is academic! Thank you for all of your hard reasesrched information. In regards to storing jugs of water, there's one more thing to keep in mind. The water may be good far past the expiration date, but watch out for the jugs. After a time, the plastic can degrade and start to leak. We found this out many years ago, as we had them stored (at room temp); and, at a certain point, we discovered multiple ones leaking. So it may be good to rotate them periodically or use more durable containers. Yes, this is an important consideration. If you look at the photo of the water jugs in the main article, they are each on shelves and bagged. I and others have found that if you stack the jugs, the pressure from the one on top can cause cracking in the lower ones and water can leak out after about a year. Having them all in individual bags with nothing pressing down (and not in a hot location), mine have been stable for many years. It's advisable to do a visual check of the bags once in a while; any water leak will result in condensation on the inside of the bag so you can check to make sure your bags are all completely clear where the plastic sticks up. Cathy, I'm curious to know how long it took for you to experience this, and were there any other jugs pressing down? While this is late in being seen and posted, and I hope you got better soon, it does not sound like the sort of response that one would expect from an old bottle of never-before-opened water. The concerns have been with plastic chemical leaching into the water slowly in a way that could potentially be carcinogenic or have other long-term health effects. But to have stomach problems 15 minutes after drinking it, that's really surprising and I wonder if it could have been coincidental timing and caused by something else. I don't know what the 49 is; it is not a recycle code and is probably just some reference number for the company, not sure. Well, since a lot of time has passed since you initially tried to post this (I feel really badly about the glitch), what ultimately happened? Were you able to pinpoint the cause of the stomach problems? Perhaps food poisoning from earlier that day? Commenting about taste here. Actually found this blog looking up if old water is safe. We just moved and we had some 4 year old sparklettes water jugs stored that we kind of forgot about. I lined most up and dumped them for sparkletes to pick up. Apparently the movers got to two of them I hadn't lined up yet and brought them to the new place. My boyfriend foolishly didn't look at the date on the bottle and put it in the cooler. Right away I noticed it smelled and tasted off. Kind of like the smell and the taste of an old pool toy or super old pair of goggles. (a mixture of plastic and light chlorine) Of course he hadn't the clue what I was talking about "I don't taste anything" I checked the date and what do you know, it is the old water bottle that was meant to be emptied and returned. I have no idea why it tasted and smelled so strongly and chemically in only a few years or how safe it was (my instincts tell me it's probably not to safe) But thought I'd share since no one seems to have these answers. Thanks for the feedback. Ah yes, Sparkletts water bottles; I grew up with the Sparkletts trucks driving around in LA. When I moved to Northern California, they were the same bottles but they were Alhambra. A little nostalgia there! At any rate, I don't have information about those bottles. They are meant for high throughput, not longterm storage, so they might not be rated for years of stability. Although remember that there is theoretically this effect about which I have read in which water loses aeration and tastes a little funky until air is let in and it is shaken up. I have not tasted that off taste (even after opening my 8-year old bottle) so I can't say whether it was related to your experience. Today, I opened a bottled water from a LARGE retail chain, it tasted lime complete pond water. So nasty I had to examine the date......it was 16 years expired. I'd rather drank my own urine. Wtf is wrong with people they had pallets stacked of this crap. Making it on sale so people buy buy buy. While the FDA doesn't put a shelf life, someone should. Companies should not be able to sell 16 year old expired water. Sorry to hear that. I am not sure what happened there; all I can do is to refer back to the original sources of info. Again, there should not have been anything in there that would have grown after all those years that didn't grow earlier so perhaps it was a manufacturing defect, couldn't say for sure. I don't have personal experience that many years out; perhaps it is a good idea to check a bottle every few years to confirm the batch is ok since it's much easier to occasionally replace one jug than the whole lot. It's also hard to know under what circumstances these old bottles were stored for all those years (the very idea that they were that old in a store seems strange in the first place); remember that heat and light should both be avoided during storage. Thanks for sharing your experience! I just saw an ad advertising water with 30 and 50 hear shelf life. I know why they don't tell us how to do it but maybe you can. I am LDS (Mormon) and we store food and water. I want to know how to store water for 30 years too. Thanks, I would say that the Mormon practice of storing supplies and the earthquake/disaster storage of supplies have a lot in common; just with a longer planned period for the former than the latter. Nonetheless, I presume that the difference is more a matter of quantity, if you really have something that does not expire in the near future. So my best response would be just that the information put forth in the blog article already should be appropriate here as well. Now, I should emphasize that standard disaster preparedness is effectively fulfilled by being able to store something away for a decade, and sooner or later, people are probably just going to decide to update. I had some iodine tablets (for nuclear fallout, hey, why not, the bottle is tiny), and when I went about reassessing my supplies a couple of months ago (see the 1/16/19 article), I noticed that this bottle had an expiration date of 2004 if I recall correctly. I kind of doubt that solid iodide salts will expire but I decided that it was so old that I might as well get a new one. When the FDA says you can put these gallon water jugs into safe storage and forget about them, well there must a be limit somewhere (20 years? 50 years? 1000 years?) but it's not clear where that is. It's a good question and I'm not sure how to answer it. Southern California where I live is basically a desert. Our garage is incredibly hot during Spring, Summer and Fall as there is no air conditioning and windows in this space so it is closed. The backyard sits in the sun for 2-3 hours every afternoon. How can we keep 14 days of water for two persons (28 gallons) as the plastic container and plastic top will degrade. Also, if we store the water in a large garbage can, the sun will keep the interior quite hot and also degrade the water. Yeah, you are essentially in the same situation as those who don't have garages and back yards. I've lived in situations where there were lockers in parking structures that could hold most of the water (they were cool), but for 8 years I was in a condo that had no storage outside the unit. I put in shelves with lips in the back of a walk-in closet and put 1 gallon jugs on those shelves. I've found it impractical to store more than 14 gallons in situations like this (7 days for 2 people), so I've also invested in water purification systems for the worst case scenario. At any rate, you are right to be concerned about storing water in the conditions you describe, and I suggest figuring out some indoor location where you can put jugs.